When Dennis lit the fire it almost exploded into flame. We looked at each other silently. This was going to be a hot lodge. The circle of women gathered around the fire had come to this sweat lodge ceremony to burn away their collective past and forge a new beginning. They were ready for this work and clearly so was the fire. The power of their shared intention had created the invitation. It would be a hot lodge. People often ask me how hot the lodges are. While I moderate the heat through working with the fire, stones and water, the heart fire each individual brings to the ceremony impacts and influences their personal experience of the heat. 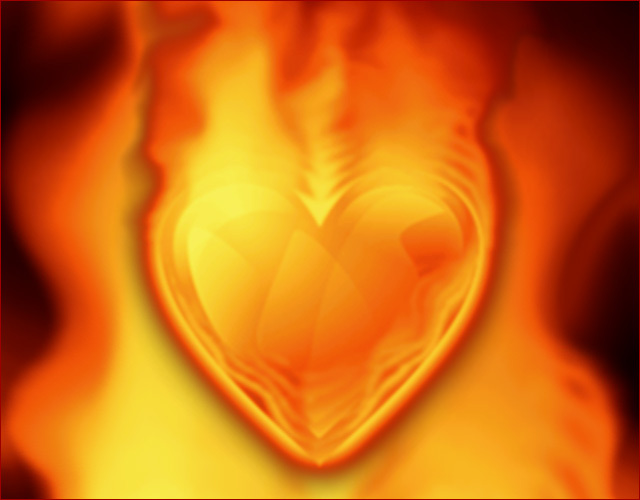 And it is this heart fire that holds the possibility and promise of sacred transformation. Our divine and sacred nature always holds a deep desire for greater expression whether we consciously know it or name it. When we step into an opportunity to embrace and nurture this divine spark it can burst into a fire of sacred passion, a fire that can catch us unaware and off guard. Such was the experience of a beautiful woman in a lodge a few weeks ago. She came to this, her first, lodge at the urging of others and with the intention of simply ‘doing’ a lodge. But her spirit came with an entirely different agenda and, as a lodge-keeper sister would say, she was cracked wide open. In her words she was changed forever. Weeks later she still holds the deep peace, grounding and spiritual knowing she opened to in the lodge. She names that day as the best of her life, surpassed only by the birth of her two children. That day when she opened to the transformational power and healing of her heart fire. This transformation is available to each of us. Our spirits are always ready. The question is whether we will call our heart fire to life.